The Sequoia Healthcare District elections resemble a game of musical chairs this year. Director Jack Hickey, whose third term wouldn't expire until 2014, is still running for one of two open seats on the five-member board, challenging incumbents Kathleen Kane and Kim Griffin, whose terms really do expire this year. "I deliberately forced this election by filing for this 4 year seat," Mr. Hickey announced on his website. Just as unusual is his longtime goal to dissolve the health-care district. Established in 1946 to run a hospital, the district changed missions in 1996 after selling Sequoia Hospital. It still collects property taxes, but now uses the funds to support nonprofits -- and that means the district has outlived its utility, according to Mr. Hickey. With a $13.8 million budget for 2012-13, the district spends $10 million for community programs such as school health services, the county's North Fair Oaks Clinic and the San Francisco State University/Canada College nursing program, according to a report posted on the district's website. With administrative costs at an estimated $600,000, and $160,000 paying for the November 2012 election, the district's expenses are expected to outpace its income by $380,000. Mr. Hickey has challenged the district's fiscal responsibility, while Ms. Kane and Ms. Griffin seem to think it's on the right track. Ms. Griffin is finishing out her first four-year term on the board. She parlayed an associate's degree in nursing from Lincoln Land Community College into work as a registered nurse. Specializing in oncology and cardiology, she worked at Stanford University Medical Center for 15 years before moving on to Children's Cardiology of the Bay Area. "I ran for the district board because my experience as a nurse taught me how important community health resources are and I believe it is important for direct caregivers to be involved in governance of those resources." Why a second term? Ms. Griffin said she's enthusiastic about the district's programs. "For example, as a cardiac nurse currently taking care of children and young adults with congenital heart disease you can imagine why I find the value in the district's Heart Safe Program, which provides defibrillators and cardiac compression devices," she said. "This is the most up-to-date equipment that has already saved lives. Increasing the survival of cardiac arrest patients alone makes all the hard work on the board worth it." An upcoming initiative coordinated with the Sequoia Hospital Foundation aims to develop a case management program designed to keep patients out of the hospital, she said. So Ms. Griffin finds it rewarding to help deliver health services to her community, but why should voters give her a second term? "I have always had to live within a budget, my medical office is run on a tight budget, and I take my fiduciary responsibility on the board seriously," she answered. "But I think if I had to give just one reason to vote for me it would be because I am a patient advocate with a high standard of care. I know that offering anything less is unethical on my part as a health-care provider. It is my hope that district residents see the value in all the services we support since they benefit everyone." Mr. Hickey acquired instrumentation expertise while serving a four-year stint in the U.S. Navy. According to his biography, he went on to register 28 patents as a researcher and electronics engineer. Mr. Hickey said this election is not about "another term. It is a poll of voters. When I receive substantially more votes than either of the incumbents, it will be a clear mandate for dissolution. I will take that mandate to my board, hopefully with a large number of my constituents, and agencies which would benefit from dissolution, such as schools, fire districts, etc. in attendance, to persuade them to do the right thing. If that fails, I will seek one of those agencies to initiate the process of dissolution." That's plan A and plan B. Plan C, what Mr. Hickey termed his "last resort," would be dissolving the district in the same way it was created -- petitioning to get the issue on the ballot and in front of voters. "With a large plurality of the vote, gathering signatures for those petitions should not be a problem," he said. Ms. Kane has served on the health-care district board for 20 years . Her educational background includes a bachelor's degree in organizational development from the University of San Francisco and certification as a surgical technician through the Stanford University Medical Center. She said she currently works as a human resources consultant, drawing upon more than 40 years of experience "in all facets of health care, including vice president of human resources of a major San Francisco medical center. "I am dedicated to improving the health of our community and fiscally responsible by guaranteeing all tax revenues are spent on health care and wellness services." Ms. Kane appears to be seeking re-election to continue supporting the district's programs. "I believe the district meets many unmet health issues in our community," she said, citing as examples as the Samaritan House free health clinic and the Children's Health Initiative that provides school nurses, counseling services and physical education programs for each school within the district. "None (of these programs) would be in existence without Sequoia Healthcare District. One hundred percent of the taxes we collect go back to health programs; none goes to operations." Jack ALWAYS has my vote. Only sane guy around! It's time to dissolve the district. The district was formed to provide a hospital and has sold the hospital. Stop using taxpayer dollars to give to the board's favorite charities. Vote for Jack. He's a highly intelligent guy. Mr. Hickey makes a good point. This district appears to have outlived it's usefulness. If he's mistaken, why is no one standing up for the district and making the case for it's continuation? While I'm sure it supports good and necessary programs; that's not the real point. I'd be much more interested to hear why this strange way to collect money for the public good should be continued? 1) It seems to be very expense heavy. If these services are really necessary, why aren't they funded like similar programs? Why shouldn't they have to provide on-going justification to the public for their continuing support? I think most of us would agree that tax money should be collected on an as-needed basis. This appears to be a situation in which taxes are being collected regardless of need, and then the board members are tasked find ways to spend the money, without ever considering whether it should have been collected in the first place. At this point, I think I'll be voting for Mr. Hickey. The district should have been dissolved long ago, when they sold the hospital. Now, a few individuals and groups find they can milk the tax payers, especially the paid administrators. The Sequoia Health Care District is the instrument of a few individuals for their own interests. If these grants are really worthy of doing, the Board of Supervisors can do that job and dispense the funds. I don't understand how someone can run for a position they already hold. None of the coverage of this election has explained that. Jan, I know it is confusing, but the seats aredifferent. The one I am running for expires in 2016. I am not an incumbent for that seat. If I win this election, I will have to give up my seat which expires in 2014. My purpose for doing this does not come from a desire to sit on this board for 4 more years. It is my way of polling voters to see if they support dissolution of the District. A vote for either of the incumbents is a vote to have the District continue collecting taxes originally assessed to build, operate and maintain Sequoia Hospital which they no longer own. A vote for Jack Hickey is a vote supporting dissolution, with taxes and assets being redistributed to schools, public safety, etc. If you think this is confusing, you are in good company. The former President of Notre Dame de Nemur, John Oblak, filed to run for a 4 year seat in 2004, when he was supposed to run for the 2 year seat to which he had been recently appointed. When asked by the elections officer whether he was running for the two year seat or the 4 year seat, he thought 4 years was a better choice. There was a lot of legal scrambling to get his name off the ballot, otherwise he would have been running against his buddies on the board. As the Director of Programs for a local non-profit that has received funding from the Sequoia Healthcare District to implement our curricula, I can tell you that their funding has been instrumental and has allowed us to reach thousands of youth in the area with vital health information. 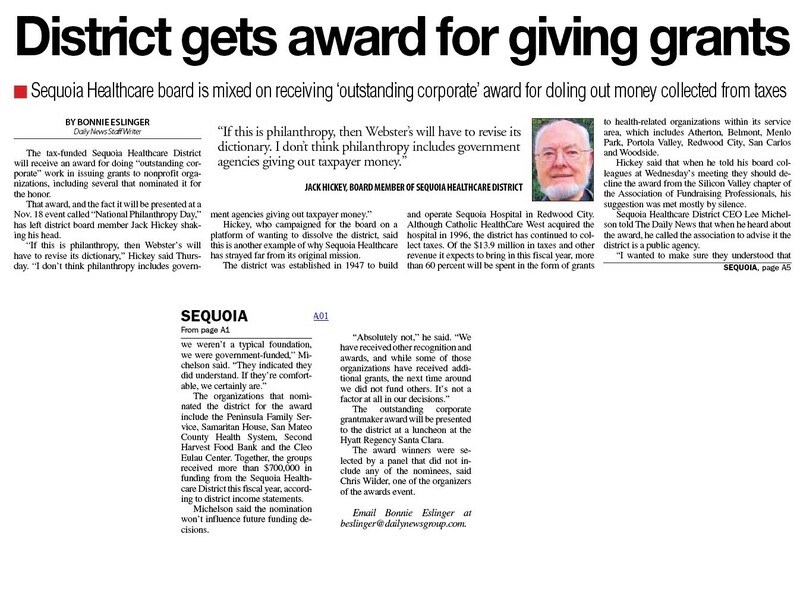 I'm so thankful the Sequoia Healthcare District is around to help agencies who are trying to make up for the lack of school funding for "extras" like health education. that same funding could come without costing the taxpayers over $400,000 in overhead costs. Which means there might be even more money available for your non-profit. Vote only for Jack Hickey and only him. The district has long over lived it's purpose. It is now a way for the politicaly connected few to curry favors. This district needs to cease to exist. When you ask voters to set up a district to manage a hospital, and then you sell the hospital, you should shut down the district. The district isn't "free" to choose use the funds as they see fit, even for good deeds. We set up the district for a reason. The reason no longer exists. I voted for Jack Hickey and only for Jack Hickey and strongly encourage others to do the same. I'm a new resident of San Mateo County trying to do thorough research for this year's county elections. I find this issue of whether the Healthcare district should exist to be very interesting and I'd like to understand more about its current function. I looked at the district's website hoping to review its meeting minutes, but I can't seem to find them in the archived minutes section of the website. If anyone knows where the public can locate the minutes online, I'd love to know! New, I find 95% of the minutes to be accessable. I also find that not all of them are searchable. They sometimes use bit mapped images rather than searchable PDF files. I suggest that you visit my website www.xshcd.com for considerably more information. Also, look at the many other Town Square Forum topics on the Sequoia Healthcare District. We appreciate that you are taking the time to do a little research - on your own! - instead of just following the crowd. I hope you will come to the conclusion that voting for Jack Hickey, and only Jack Hickey, is the right message to send to the district. Jack, I don't buy your story. Community health care is under funded, whereas better-funded inpatient and outpatient programs seem to be rife with unnecessary tests, and itchy trigger fingers that are looking for opportunities to do subsidized surgery. Community health is about prevention, and treatment of chronic conditions that - whoa Nelly - if you get one, you're gonna find out you aren't covered, aren't treated, aren't served, unless you're rich - or on your last legs - in which case you're to a) spend it all down for the privilege of b) leaving yourself to the mercy of MediCal. No thanks. We need more community health, not less. I am a homeowner so I'm paying for the district and I think it's a good fiscal deal. In fact I think it's fiscally irresponsible and anti-homeowner to reduce funding for community health care. Prevention is a bargain. You want to go after costs, open your eyes and look at how I'm paying for people to go to expensive emergency rooms instead of affordable outpatient. Caregiver, you're more than welcome to pay out of your own pocket for healthcare or other charitable causes - just don't expect the rest of the voters in the county to do so. The District was created to fund and run Sequoia Hospital, period. Now that the hospital has been sold, the District needs to be dissolved. I'll be casting my vote for Jack today. Good luck! No, it's the other way around. Prevention is cheaper than Jack's plan. Lack of prevention is why Medicare and insurance are spiraling out of control. Since we're going to offer you health insurance when you're 60 (including free coverage if you take Medicare Part C), we should make darn sure you know which end of the diabetes finger stick you're gonna be bleeding onto if you make bad decisions. And if your real agenda is abolishing Medicare, feel free to not apply for it, and to pay out of pocket for primary private insurance or a la carte healthcare - I don't have a problem with that. the problem is that the money for these worthy things can still be given BUT without the ridiculous over head of the health care district. Which, by the way, was started to pay for a hospital which has since been sold. The need for the district, the need the voters originally voted for, is GONE. I see no reason to continue to pay a ceo and his staff to administer the distribution of money that could easily be distributed by the counties without the ridiculous overhead. Menlo Voter, Jack Hickey is not proposing the money remain for county health care but rather for "agencies which would benefit from dissolution, such as schools, fire districts, etc". Besides, Sequoia's overhead is only around 7-8% - I see no reason to think the county would be any more efficient. Voting for Jack mostly a symbolic vote that does nothing to move health care forward, mixed with a little bit of obstruction. Your complaint is really with the CA legislature, which in 1994 authorized the Hospital Districts to become Healthcare Districts instead. Feel free to complain to Sacramento "You didn't cut health care enough, there's too much money going to the hospice, too many school nurses, and those meals on wheels are too fancy" Don't be surprised if people don't take those complaints seriously. the county can do whatever it wants with the money. Without the ridiculous overhead it currently has which is just political payback to the politically connected of San Mateo County. The fact is the people voted for a HOSPITAL district not a healthcare district. I'm "shocked" the state legislature voted to rig things so their politically connected democratic cronies could cntinue with their largesse. If we can't control things at the state level (we can't) we can certainly control them at the local level (if we try). Menlo Voter, if you google sb1169 Maddy you'll see the 1994 law was mainly sponsored by a pretty famous state senator named Kenneth Maddy - I would think Republican governor Pete Wilson signed it. Not a conspiracy of Democrats. Listen, the board can't dissolve itself and SM county doesn't even want Sequoia! The county is trying to absorb Peninsula Healthcare District for its surplus, though. I'm willing to trust assemblyman Gordon and senator Simitian and SM County Health commish Fraser on all that - hope I'm not disappointed. Actually, according to one of the board members the district can dissolve itself. They simply chose not to. It was recomended by the 2001 civil grand jury. The board's response was "we choose not to at this time." Just because some state law says they can do what they did doesn't make it right. The district was started by the voters to fund a hospital which it no longer owns. The right thing to do is dissolve the district. I wouldn't trust Rich Gordon to walk my dog let alone do the right thing here. Sorry we didn't cut healthcare enough for you. Good luck getting old. But quit using elections as a symbolic issue to do nothing of substance. this isn't about cutting health care. Those funds could still be used to fund health care. JUST WITHOUT THE ADDED EXPENSES OF THE DISTRICT AND ITS EMPLOYEES. What part of that don't you understand? There is no need to get excited or repeat yourself about points I've already addressed - of course Jack's proposing cutting health care - see above that Jack isn't targeting the proceeds for health care but rather for "schools, fire districts, etc". Plus you didn't respond to my point that the district's overhead is not especially high and there's no reason to think the county is more efficient - do you truly think the county is efficient? So as long as you're still ruminating about it, you didn't address the point that it was a Republican-sponaored bill signed by a Republican governor, not "democratic cronies" (your words). And while you're at it, was it truly fiscally responsible for a sitting board member to force a $160k election so he could get a different seat? Isn't that just throwing a tantrum in public? You can't win in the statehouse, you can't win at the county level, you just lost at the disctrict level...have you considered the possibility that you're just plain wrong about wise use of public funding for prevention? And have you considered the fact that if this was baseball, your team would need way better pitching, hitting, throwing, strategy? and you haven't addressed my point that the reason for the district no longer exists. I don't care if it was a republican or a democrat that authored a stupid law. A stupid law is still a stupid law. And right is still right. the right thing is to disolve the district. Just like the civil grand jury determined would be the RIGHT thing to do. Voter intent is the issue. When voters established the Sequoia Hospital District and accepted a property tax assessment to build, operate and maintain the hospital, they never envisioned the organization which has claimed the right to continue those taxes after they sold the hospital. That organization is the so-called Sequoia Healthcare District, would be philanthropic foundation. Voter intent? Jack, we just told you: No. were you a voter in 1941? didn't think so. You aren't the voters that created the district are you? Neither Jack nor I were old enough to vote when the district was formed in 1946. You had to be 21 years old then so - go ahead, ask the 87 year olds in this county if they want to cut healthcare more. And go ahead, you count how many times opponents of the district petered out in the voting booth and every other venue. Certainly, 2010 was a referendum on keeping the district, and the voters clearly elected to have a majority of the board to do their jobs and not be obstructionists. Times changed since 1946. Caregiver said: "And go ahead, you count how many times opponents of the district petered out in the voting booth and every other venue." How many times has the district bit the bullet? Why have they not put the issue on the ballot to seek legitimization of the district? Unfortunately, the dissolution votes were distributed over 7 candidates. The district bit the bullet. In 2004 we had an unusual election in that three seats were involved. Two 4 year seats of incumbents McNaughton and Kane were up for re-election, as was the 2 year seat of appointed director John Oblak. When John Oblak inadvertantly filed for the 4 year seat, the district was in a panic! That would have split the vote and ensured victory for the dissolution candidates. Not to worry. The good old boys club came to their rescue. Oblak's name was removed from the ballot. And as a bonus, would be candidates (including dissolution candidate Merrilee Gibson) for Mr. Oblak's two year seat, who sought to take advantage of the extended filing period created when the incumbent (Mr. Oblak) failed to file, were denied that opportunity. Judge Forcum stated that he was familiar with election matters, including the requirement of an oath, and that he did not consider Mr. Oblak an "incumbent" whose failure to run by August 6 operated to extend the deadline for others to file until August 11. Judge Forcum said that he was making a record of his prompt ruling so that the matter might be taken to a higher court. In reality, no higher court could decide the matter fast enough to get Merrilee, or anyone else, on the November ballot for the 2-year seat. Judge Forcum marked my proposed ORDER "denied", and started to sign an order presented by Mr. Oblak's attorney removing him from the ballot but paused. Judge Forcum then stated that he did not know Mr. Oblak personally but that he (the Judge)was sometimes a part-time professor at the college where Mr. Oblak is President. Full text of the transcript will follow. Mr. Oblak was rewarded for his fumbling by being appointed to the now vacant 2 year seat by the San Mateo County Board of Supervisors. How could he not be an "incumbent" as adjudged by Forcum in his decision to deny the Writ of Mandate mentioned in a previous post? Good old boys do get their way. Caregiver said: "Menlo Voter, Jack Hickey is not proposing the money remain for county health care but rather for 'agencies which would benefit from dissolution, such as schools, fire districts, etc'". By my estimation, Sequoia Healthcare District assets, including the value of the profit sharing arrangement with Sequoia Hospital, are nearly $40,000,000. Property tax income is ~$9,000,000/year. The likely result of dissolution would see those assets and property tax revenues distributed in much the same manner as the distribution stated above. Those listed beneficiaries will not include Nurses who currently account for $1,000,000/year of District expenditures. Sequoia Healthcare District spent $7,000,000 Web Link for the education of 280 nurses in the program who should have graduated by 2012. Only 253 are reported to have graduated. Of those, only 73 are working as nurses in the District. Since each received a subsidy of $25,000 from the oia Healthcare District, the total benefit to the community served by the District is $1,825,000. That means that $5,175,000 of property tax dollars left the District over the seven year period covered by the report from SFSU. Put another way, $739,000+ each year has been expended with no benefit to the community served by the District. Elimination of those beneficiaries puts an additional $3,899,000 in the hands of the likely beneficiaries listed above, to be directed by elected officials of those agencies. Add to that elimination of more than $1,200,000 for payroll, Directors health insurance, PR, election costs, legal costs, etc. which will accrue with dissolution and we have more than $5,000,000 available to legitimate agencies controlled by our elected representatives. "I am a homeowner so I'm paying for the district and I think it's a good fiscal deal." Last time I looked, Menlo Park - Fair Oaks was NOT in the Sequoia Healthcare District! What precinct are you in, caregiver? Menlo Park Precincts 4401-4411 are not in the District. But, I'm sure that the residents of those precincts benefit from the generosity of those of us who do pay taxes in the District. And, so do East Palo Alto residents who are not taxpayers of the District. These two areas are home to 43,852 residents with a CNI (Community Need Index) score of 4.0. They are the neediest, and collaterally receive considerable benefit from Sequoia Healthcare District Programs funded by District taxpayers. It would appear that caregiver may in fact reside in the Sequoia Healthcare District. It is also likely that caregiver does not reside in Menlo Park. Sorry for any misinformation I may have implied.